Young boys continue to have the highest rate of autism diagnoses, but Danish doctors are diagnosing more girls, teenagers and adults with the disorder than they did in the mid-1990s. That’s the finding from a 16-year study published 20 February in the Journal of Autism and Developmental Disorders1. Many studies look at the prevalence of autism, akin to taking a snapshot of the number of diagnoses in a given population. The new study instead examined the disorder’s incidence, or newly reported diagnoses, each year. Between 1995 and 2010, nearly 15,000 people received a new diagnosis of autism in Denmark, the study found. During that time, the incidence of autism overall increased from 9 diagnoses per 100,000 people to 38.6. For instance, the number of males with a new autism diagnosis quadrupled from 13.2 per 100,000 people in 1995 to 58 in 2010. In the same time period, female diagnoses increased sevenfold from 2.6 to 18.6 per 100,000 people. The greatest increase in incidence among girls came from diagnoses of two subcategories of autism, Asperger syndrome and pervasive developmental disorder-not otherwise specified (PDD-NOS). Both categories are being subsumed into the autism diagnosis in the newest edition of the Diagnostic and Statistical Manual (DSM-5), the American Psychiatric Association’s guidelines for diagnosis. And both are generally thought to represent the higher-functioning end of the autism spectrum. “That is in a way interesting because it goes against the idea that girls are always more severely afflicted [than boys],” says Eric Fombonne, professor of psychiatry at Oregon Health and Science University, who was not involved in the research. The researchers examined records from the Danish Psychiatric Central Research Registry, which contains reports on inpatient and outpatient care and diagnoses in Denmark. To standardize the definition of autism spectrum disorders in the study, the researchers included only people up to 65 years of age who were diagnosed by a doctor using the tenth edition of the International Classification of Diseases, a publication of the World Health Organization and the DSM-5’s international counterpart. The ICD-10 was last revised in 1994 and still lists Asperger syndrome and PDD-NOS as diagnoses independent of autism. 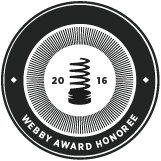 Its next edition is expected in 2017. Boys are diagnosed more often than girls and at younger ages, the study found. On average, boys receive a diagnosis at 9 years versus an average of 11 years for girls. In boys, the sharpest uptick over the study period is in childhood autism — a subtype of the disorder in which symptoms appear before 3 years of age — from 2.1 cases for every 100,000 people in 1995 to 17.6 in 2010. Another spike is in rates for PDD-NOS, which increased fivefold to 25.8 per 100,000. In girls, new cases of PDD-NOS showed the steepest gains, jumping 11-fold from 0.8 cases to 9.3 per 100,000 people. 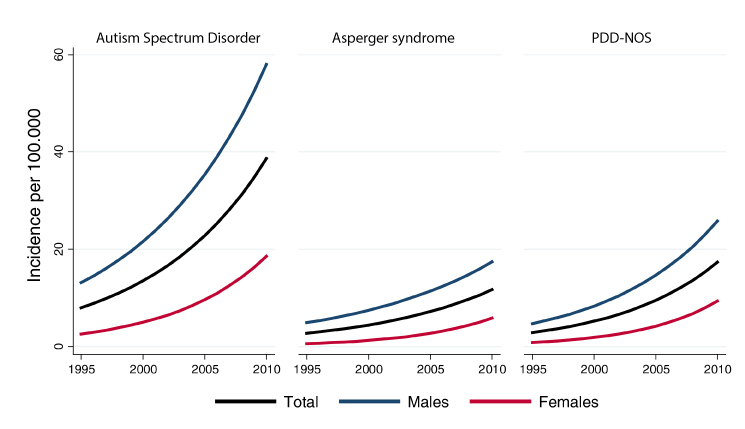 Diagnoses of Asperger syndrome increased from 0.6 cases per 100,000 in 1995 to 5.8 in 2010. Rapid growth: The fastest rise in new autism cases is in those diagnosed between 14 and 20 years of age, followed by adults diagnosed between 40 and 65 years of age. Individuals diagnosed between 21 and 65 years of age account for about 9 percent of the new cases — but their proportion also significantly increased over the time frame of the study. Like girls, many of the adults are diagnosed with higher-functioning forms of autism, such as Asperger syndrome and PDD-NOS. Overall, PDD-NOS diagnoses show steep growth, just behind childhood autism. However, Lauritsen says, PDD-NOS is not as well defined as other autism subtypes such as Asperger syndrome. Individuals diagnosed with PDD-NOS often have social deficits but lack repetitive behaviors, a core symptom of autism. Studies suggest that under DSM-5 guidelines, some people with PDD-NOS would fall into a new category called social communication disorder rather than autism. “Based on the abovementioned research, approximately 53% percent of the increase in autism prevalence over time may be explained by changes in diagnosis (26%), greater awareness (16%), and an increase in parental age (11%). While this research is beginning to help us understand the increase in autism prevalence, half of the increase is still unexplained and not due to better diagnosis, greater awareness, and social factors alone. Environmental factors, and their interactions with genetic susceptibilities, are likely contributors to increase in prevalence and are the subject of numerous research projects currently supported by Autism Speaks. Some years ago?? The quote from Autism Speaks was written in 2010 only four years ago not decades ago. Furthermore, a recent University of Chicago study implicated environmental factors (toxins) as contributing to the autism increase. Last year Autism Speaks and UC Davis co-hosted a conferenece of the epigenetics of autism. Presenters refuted the idea that autism increase is only due to so called better diagnosing and maintain the increase is real. There are simply more children with autism than ever and that is not because doctors got really good at diagnosing it. I reject the better diagnoses/greater awareness idea because it implies the autism increase is not real but a result of better diagnosing- that people who would now be dxed were somehow overlooked in the past. Although people with autism existed in the past (1 in 10,000) we did not see them in these numbers now 1 in 88. Where are all the 1 in 88 autistics adults? I say they weren’t there in the past at least in the numbers we’re seeing today. I think we are seeing what should be normal chldren who early in life suffered a toxic expsoure leading to a disablity. These researchers should go out in the field and visit communties hard hit by autism or look at autism clusters like the Somali one in Minnesota- this is not normal. My street alone- 3 boys (my son included). My sons K-2 SPED class- 6 kids and that does not include the more severely autistic kids I see pull up in the van at his school everyday. There is no way you would have missed these kids. On SFARI, I see environmental factors being downplayed with the emphasis on put on genetics research. Autism is epigenetic. Even if a child has hidden genetic mutations something environmental is triggering expression of the mutation. I do not think researchers can have an honest conversation about the autism increase without including the environmental piece because that genetics is not the whole story. The majority of autism cases are epigenetic – an interplay between genes and the environment. I don’t think that anyone with even a cursory understanding of embryology and genetics is surprised by the “lack of full concordance between monozygotic twins.” One barrier to understanding the “genetic” versus “environmental” contributions to the development of ASD must be in understanding what “environmental” influences act; in particular, a great deal of recent evidence suggests that early to mid-gestation is an important period in the development of ASD. You might be interested in material at this site that discusses, for example, somatic mutations in neurons early in prenatal development that could follow different paths in monozygotic twins, and in the clear developmental differences in monozygotic twins, including–for example–such obvious differences as birth weight. While I think exposure of the parents over a lifetime or during pregnancy can affect genes, I am more interested in post natal exposures to our children. There does not seem to be a lot of research focus or money being channeled to post natal as compared to pre natal exposure that may result in autism. I think anyone familiar with Autism epidemiology recognizes the muddle of conflicting figures that have emerged by varying researchers in differing populations and studying varying populations. Adding to the confusion is attempts by varying researchers to implement diagnosis of a disorder of early infancy and childhood to adults some 40 – 65 years after their birth. It is now clear from many other areas of research that environmental and genetic factors are at play. The most recent research undertaken by University of Chicago strongly evidences environmental factors can play a cause with the focus being made previously in related research to pollutants , toxins , viruses and pesticides. Those clues are provided both by elegant genetic work , physiological studies and neurology. 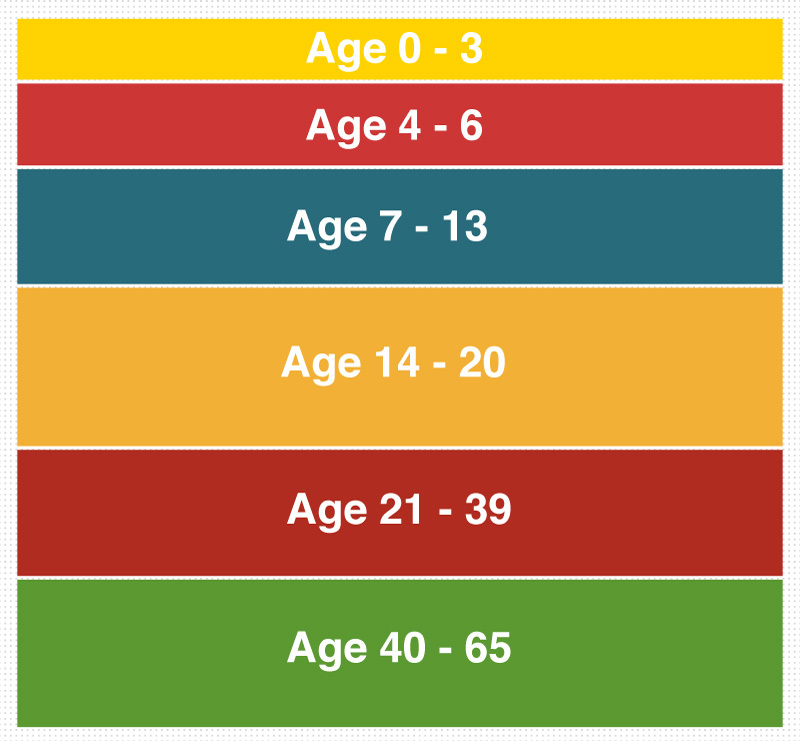 The CDC’s 2008 ADDM survey found an administrative prevalence among eight-year-olds of 1:88. But of that number, 20% had no previous autism diagnosis. This speaks to a large population of autistic people who are either undiagnosed or misdiagnosed. If this is the case, and it seems to be, then an increase in diagnoses is a good thing – it means more people who need support and accommodation can be helped. 20% of 1 in 2,000 is not a significant increase. The problem is here is that while the diagnostic criteria for autism has been pulled much more tightly in the USA, the criteria for autism in Denmark has grown much more elastic. We are no longer comparing the same condition. There is no epidemic of 40 something year olds suddenly diagnosed with autism here. Clearly someone in Denmark who is socially awkward can receive a diagnosis of “autism.” This is not helpful to American research. We need to rethink our investments in international epidemiology. Such research from Denmark is not useful nor relevant to Americans. What complicates the matter is researchers sitting on boards of direction at various regulatory agencies with significant conflict of interest always finding ways tactics for minimizing this autism epidemic. Leo kanner for his orginal study for his first 10-12 studies had to go around the world to find his case studies. Today for the same number of individuals with autism, you need to go to the first public school near you. exactly! Kids autism even severely affected kids are not hard to find these days.